We finished our cross-country drive last Saturday, but I’ve been too busy to blog about it. We left Iowa and crossed Illinois uneventfully into Indiana. We were cruising along when we hit all manner of roadwork south of Indianapolis. Indiana turned to be the capital of construction delays with no apparent actual construction. What’s more, its drivers don’t seem to know how merge when traffic is slow. Instead driving in two lanes to the merge point and then merging, everyone wanted to merge as soon as they saw a merge sign. Even truck drivers, who should know better. So instead of arriving at our Thursday campground at 4, we pulled in at 6:30 and saw … another line. Campgrounds in the off-season tend to be pretty empty, except on the weekends. For example, when we camped at Stone State Park near Sioux City, ours was one of only four campsites in use and there wasn’t a park ranger in sight. But when we entered the Hardy Lake State Recreation Area in south central Indiana there were three other campers lined up to get in. It turned out that this was the park’s “Trick or Treat Weekend,” and people were coming in early. 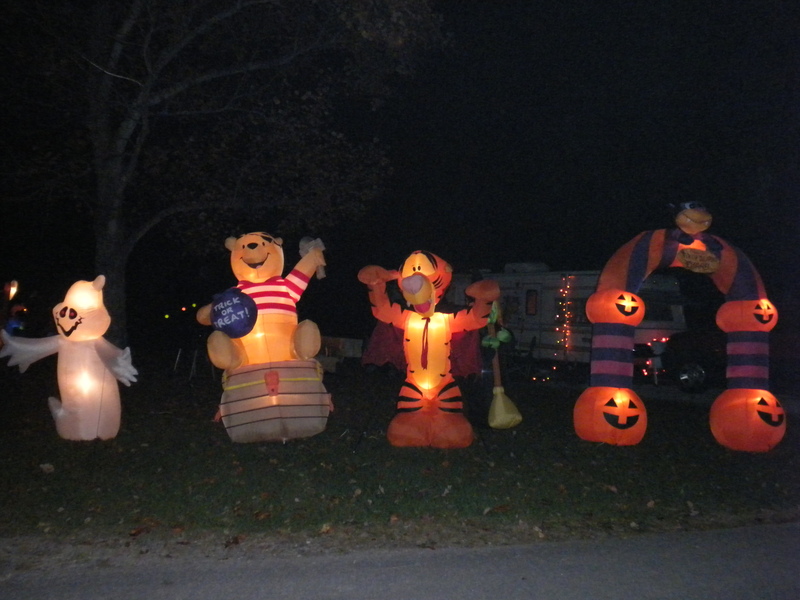 Not only was the campground nearly full, but almost every RV had Halloween decorations on or around it. One even had a movie screen attached to the side and was showing kid’s movies. This event appeared to be the biggest thing happening in south central Indiana that weekend. It made for an entertaining end to a frustrating day. Now we are ensconced in North Carolina for the winter, but there might still be a few adventures on the horizon. License plates seen: 40 U.S. (all but Connecticut, Delaware, D.C., Hawaii, Massachusetts, Nevada, New Hampshire, New Mexico, North Dakota, Rhode Island, and Vermont) and three Canadian (B.C., Alberta, and Ontario). I like that you counted license plates. And that you still use the serial comma.